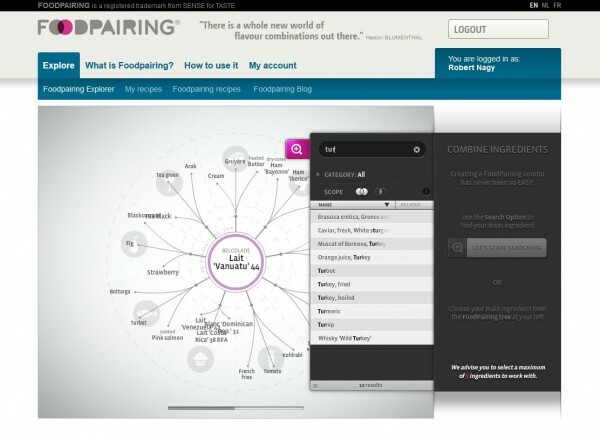 The original Foodpairing website went online about 5 years ago and depicted flavor combinations for about 250 ingredients as static graphs. It was always intended as a source of inspiration, because the details – such as what amounts of ingredients to use or how to prepare them to really make the pairing work together – were left to the user. Ingredients in the graph were grouped by categories like fruits, meats or fish, but browsing from tree to tree was very inconvenient due to the static user interface. I also had to take notes on a piece of paper for my current session of flavor pairings, because there was no option available to click my ingredients together on the website itself. Despite these difficulties, I used the website a lot since many good ideas and inspirations were hidden in the graphs. 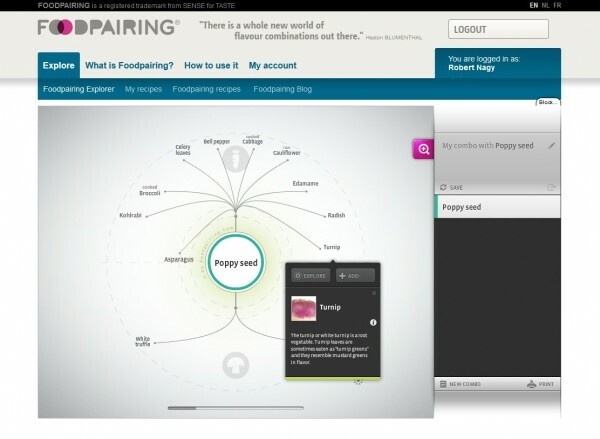 About one year ago a pro version of Foodpairing was introduced with a new user interface. First, this new site was only intended for professionals from different parts of gastronomy. The old static website was still available for free for any user. About two months ago the free website disappeared and, obviously, the business model changed slightly as well. 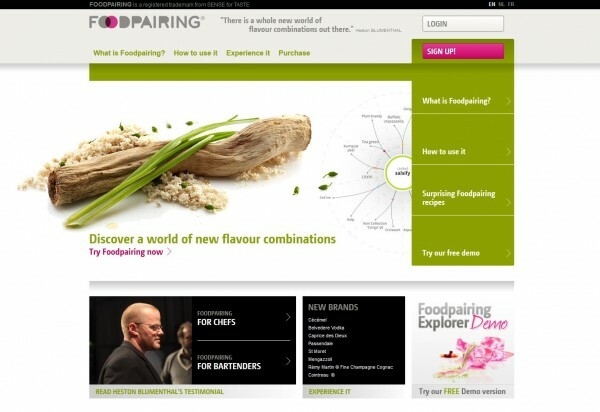 Now anybody can register at the renewed Foodpairing website and enjoy the advantages of the new user interface. As a free member only 100 ingredients are accessible. 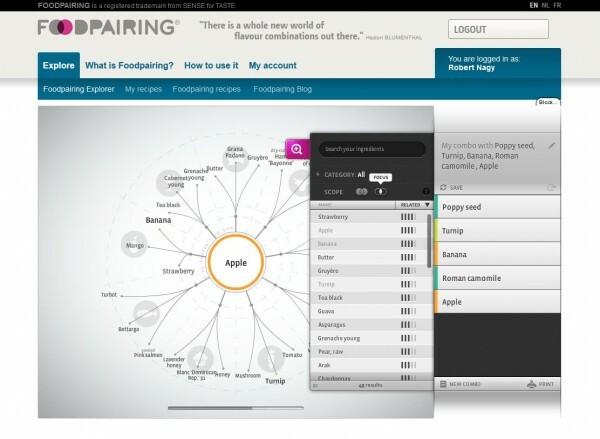 To access the continuously growing full database of currently 870 ingredients Foodpairing offers a monthly subscription for 15 Euros or a yearly for 129 Euros. So there are several levels to check out Foodpairing. 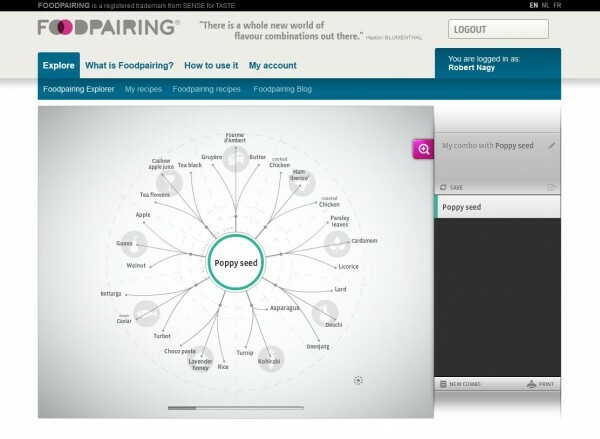 To my opinion the pricing is ok, if you consider that you get an average cookbook for a monthly subscription fee and Foodpairing gives you a lot more inspiration. For users of the previous static website, probably the new user interface will be the most interesting first impression. The graphs resemble the original grouped structure, but now they are more integrated and transparent. 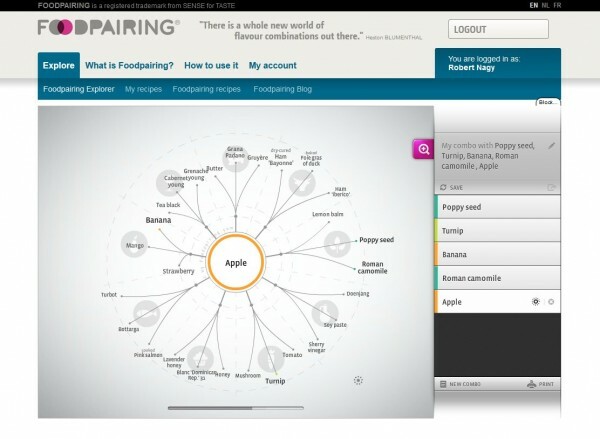 The center of the pairing graph shows the currently chosen ingredient, which is surrounded by icons of food groups and up to 3 pairing options each. The icons can be turned off if they disturb readability. For more pairing options you can click on the node next to the main ingredient in the center and drill down to a sub-tree. Most categories contain several subcategories too which can be accessed this way. Vegetables for example are divided into vegetables and mushrooms, or fish is divided into fish, shellfish and other seafood (like algea or caviar). Clicking on the main ingredient in the center, you can return to the original graph showing all categories. By clicking on the name of an ingredient, first a box with a small image and a few lines of information is displayed. 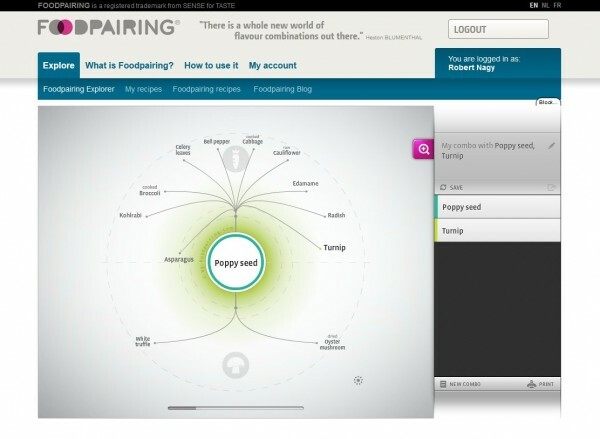 Furthermore, you can choose between two options: by clicking on “Explore” you can drill across to the pairing graph of the chosen ingredient, or by clicking on “Add” you can add the food chosen to your combo list in the right panel. Ingredients in this combo list make it very simple to keep track of your current session and to immediately access the graphs of your selected ingredients. 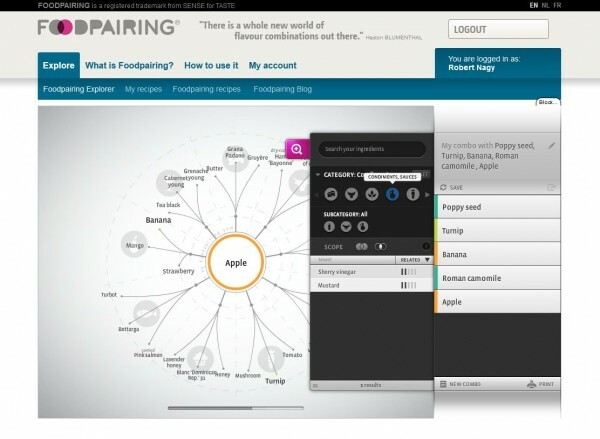 Additionally, all ingredients in the combo list appear highlighted in the currently displayed pairing graph. There are two possibilities to get information about how well two ingredients pair together. The obvious option is the graph itself, where pairings are displayed either in the inner or the outer circle around the main ingredient. The closer an ingredient to the center, the higher the chemical similarity and the better the pairing. Another option is to use a helper menu which can be accessed via the purple zoom icon on the right. Pairable ingredients are listed according to their distance, while similarity is visualized using a scale of 5 different values. This menu contains several more useful options as well. If the combo list is empty, then the menu allows to search among all (currently 870) ingredients. After selecting and adding one or more ingredients to the combo list, the scope options get activated. The left icon shows the union of pairable ingredients for all elements in the combo list, while the right icon limits the list to the intersection only. Hopefully, sometimes soon this kind of scope will be implemented for the graph visualization too, where this filter could help to black out ingredients that are less pairable for a context defined by the current state of the combo list. The ingredient list in the menu can get very long, so the elements can be limited to single categories or subcategories. This is extremely helpful if you’re looking e.g. only for a special oil to pair with your current combination. Finally, the combination list can be saved for registered users and you can even add recipes to stored pairings. The Foodpairing website was thoroughly extended and enhanced recently. Its current user interface is very easy to use and is a great help in the creative process of developing new dishes or enhancing established recipes. The monthly and yearly subscription fees are in the same price range as an average cheap cookbook or books of top chefs respectively. 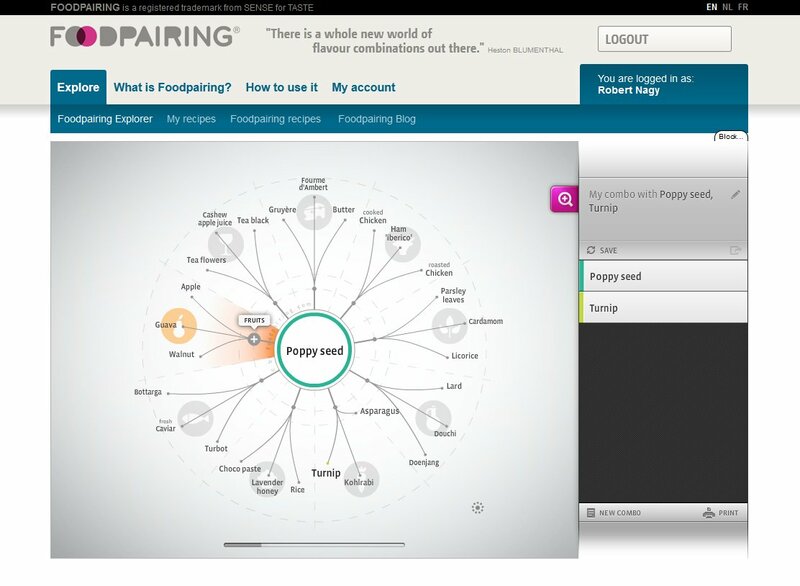 For those, who already mastered the basic concepts of cooking and who are searching for new inspiration and ideas only, Foodpairing will be of much higher value than any cookbook. PS: If you’re curious about what can be created using the ingredients from the combo list in my example, come back later this week, I’ll post a recipe of my interpretation on it. Wow, great read – thanks! I will definitely have a look at the website (haven´t been there before…). My inspiration for combinations were the master cook books and recently the Flavour Thesaurus which led to combinations of pea, potato and rosmary for example. 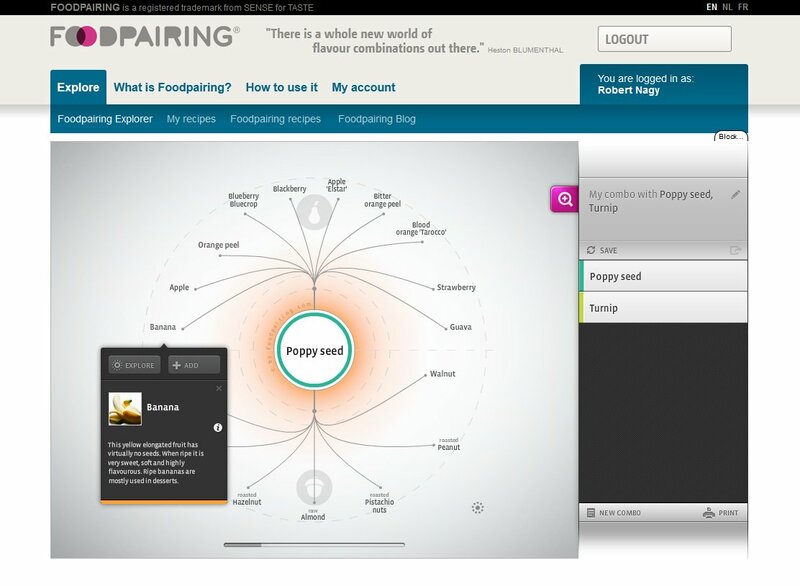 It´s almost always a fun read but I´m very curious about the possibilites of the foodpairing website! I wrote a short review about the Flavor Thesaurus in 2010 when I discovered it by chance. It’s a very nice book, and although it covers only 99 ingredients, the additional stories about where the pairing originates from and some simple recipes help a lot in transforming a pairing to a new dish. I prefer Foodpairing and the Flavor Bible to the Flavor Thesaurus, because they contain a lot more combinations and are much easier to use. You should really check out the Flavor Bible if you haven’t done it yet. I think this is one of thе mοѕt vital infο for me.